July 15, 2012 - Boeing projects the world will face an unprecedented demand for airline pilots and maintenance technicians over the next 20 years as global economies expand and airlines take delivery of tens of thousands of new commercial airplanes. 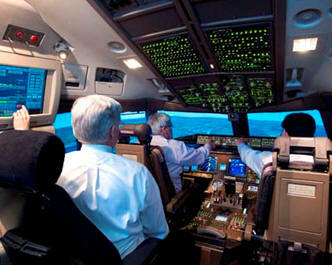 At the Farnborough International Airshow, Boeing released the 2012 Pilot and Technician Outlook a respected industry forecast of aviation personnel. The Boeing outlook indicates that by 2031 the world will require 460,000 new commercial airline pilots and 601,000 new commercial airline maintenance technicians. "In many regions of the world, our customers are facing challenges in recruiting personnel due to pilot and technician shortages," said Sherry Carbary, vice president, Boeing Flight Services. "Boeing is committed to developing innovative solutions that address this critical need by leveraging our knowledge, expertise and experienced global team to give our customers and the industry the training advantage they need to succeed." While overall demand for aviation personnel remains strong, the projected need for technicians has decreased from last year, due in part to improving airplane technology and maintenance efficiencies as well as older airplanes being retired sooner than average due to higher fuel prices. The result is better than expected reliability and longer maintenance check intervals. Demand for maintenance personnel, however, is still expected to grow in proportion to the expanding global fleet. A pilot shortage has already arisen in many regions of the world. Airlines across the globe are expanding their fleets and flight schedules to meet surging demand in emerging markets. Asia in particular is experiencing delays and operational interruptions due to pilot scheduling constraints. The Asia Pacific region continues to present the largest projected growth in pilot demand, with a requirement for 185,600 new pilots. China has the largest demand within the region, with a need for 71,300 pilots. "Meeting this exponential demand requires increased reliance on new, digital technology such as online and mobile computing," said Carbary. "Boeing is expanding its training technologies and the reach of our partnerships and working to develop a global flight school network to better supply aviation talent for the future." As new-generation airplanes come to dominate the fleet over the next 20 years, airplane reliability will improve and maintenance check intervals will lengthen. Although this trend will moderate demand growth, the requirement for maintenance personnel will continue to expand with the size of the global fleet. Emerging markets that currently recruit maintenance technicians from outside the region will have to develop a foundation for training qualified technical personnel from within the local workforce.